The Mumbai airport saw a busy day on October 6, 2017 morning as Bollywood celebs were snapped at the airport on their respective travel schedules. 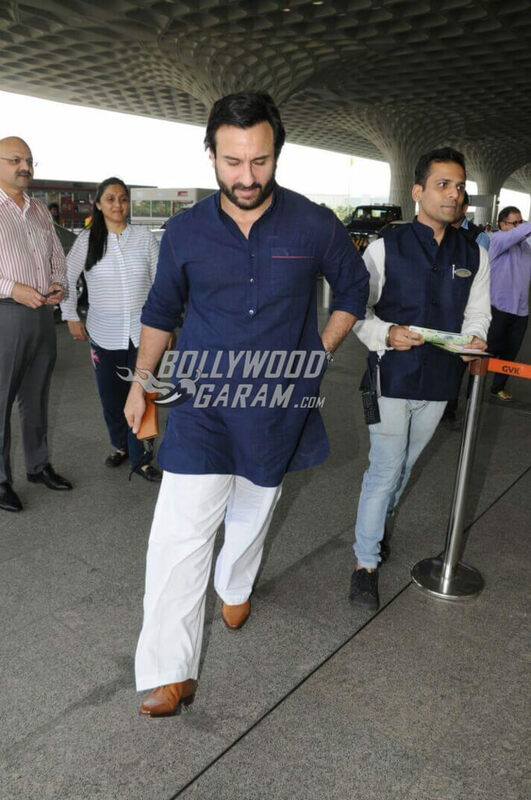 While Prabhu Deva, the Indian choreographer, director and actor was seen wearing a printed shirt with trousers and printed loafers, Saif Ali Khan who will be seen in Chef releasing on October 6, 2017 was snapped in a blue kurta and white pants teamed with brown shoes. Saif has been promoting Chef ahead of the film’s release first in Delhi and then on the sets of the comedy show, The Drama Company. Chef’s trailer has grabbed eyeballs since the time it was launched as it unveils the story of how a relation between a father and a son evolves with time and because of food as the two come up with the concept of a food truck. The film will be helmed by Raja Krishna Menon and jointly produced by Krishan Kumar, Bhushan Kumar, Raja Krishna Menon, Vikram Malhotra and Janani Ravichandran. The airport also welcomed Varun Dhawan who is currently riding on the success of his recent release, Judwaa 2, where he was seen playing the double roles of Raja and Prem in the remake of the original Judwaa starring Salman Khan. Judwaa 2 is reportedly fast approaching towards the Rupees 100 crore mark at the box office. Varun was seen in a black printed t-shirt with a black jacket and blue denims paired up with colorful footwear and a pair of black glares. He was seen smiling for the cameras and walking in style towards the airport entrance. Another Bollywood celeb who was spotted in her travel schedule was Dia Mirza. The former Miss Asia Pacific was seen wearing a white tee, blue denims, white sneakers and a long jacket. She looked cheerful as she made her way at the airport carrying a brown tote bag. Exclusive photos of Bollywood celebs at the airport!